​Click here to read Artistic Director Scott MacPherson's preview interview with clevelandclassical.com. ​Click here to hear Cleveland Chamber Choir member Megan Thompson preview the Fall in Love concert for WCLV ideastream. Click here to listen to WCLV's interview with Artistic Director Scott MacPherson and composer Sam Guarnaccia. Click to read Daniel Hathaway's review of our "No Time Like Spring" concert at Rocky River United Methodist. Click to read Daniel Hathaway's review of the Cleveland Chamber Choir's "Americana" concert on Cleveland Classical.com. Click to read about the Cleveland Chamber Choir's concert with the John Knox Performance Series in this ClevelandClassical.com article by Daniel Hathaway. Click to read Artistic Director Scott MacPherson's interview with Daniel Hathaway about the Cleveland Chamber Choir's "Americana" Concert. Click to read The Plain Dealer's interview between Artistic Director Scott MacPherson and Zachary Lewis. Click to read the Daniel Hathaway's review of the Cleveland Chamber Choir's "In Sweet Music Is Such Art" concert. 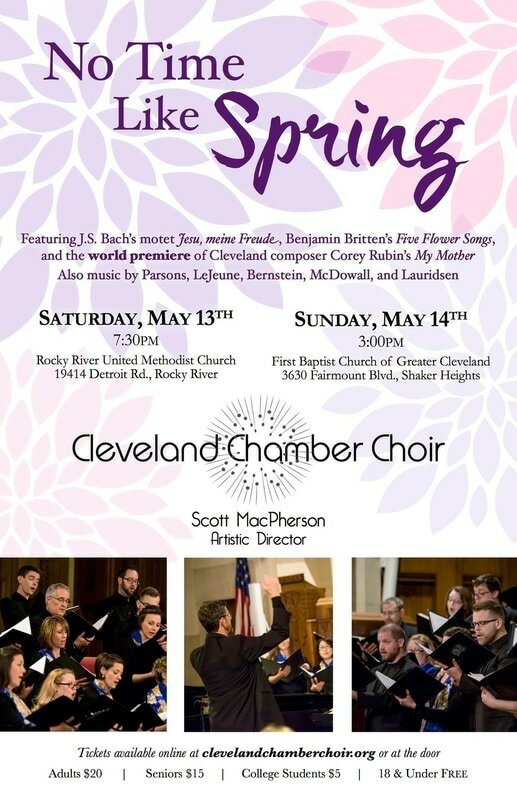 Click to listen to WCLV's Jacqueline Gerber interviewing Artistic Director Scott MacPherson and Soprano Sarah Osburn regarding the Cleveland Chamber Choir debut concert. Click to read ClevelandClassica.com's interview with Artistic Director Scott MacPherson about our debut concert.